Papiss Cisse has pulled out of Newcastle's pre-season tour to Portugal after refusing to wear club sponsor Wonga's logo on religious grounds. The Senegal striker, a Muslim, told club officials he was not prepared to promote the money-lending company. But the 28-year-old did offer to wear an unbranded shirt or one bearing a charity logo instead. It leaves Cisse's future in doubt, with sources describing the relationship between the parties as "strained". The Newcastle forward and his representatives have been in talks with club officials and the Professional Footballers' Association (PFA) in recent days but neither the club nor their shirt sponsor have been able to find a solution. Cisse's Newcastle team-mates Cheick Tiote and Moussa Sissoko are also Muslim, but have told the club they have no issue with wearing the sponsor's logo. Cisse will continue to train on his own as he attempts to catch up on his fitness after returning later than the majority of the squad following international duty with Senegal. 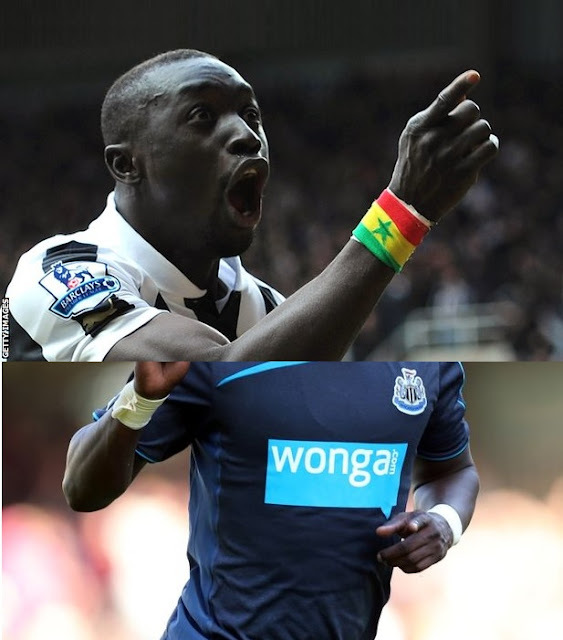 Both camps are hopeful that a solution can be found, but it seems Cisse is not prepared to move on his position. In October, high-interest pay-day lender Wonga was announced as the company to take over from Virgin Money as Newcastle's shirt sponsor from the 2013-14 season. It is thought the contract is worth around £8m a year to the club. Speaking in June, PFA deputy chief executive Bobby Barnes told BBC Sport: "We're all aware that clubs need to generate revenue and sometimes have to use a wide range of companies. "However, if someone feels very, very strongly that it's not compatible with their beliefs, then some sort of solution should be found." Cisse joined the Magpies in January 2012 and has scored 26 times in all competitions.